Just under 60 percent of the PhD graduates from U of T are working in higher education, the project found. This includes teaching-stream faculty, full-time and part-time lecturers, adjunct professors, research associates, postdoctoral fellows and university administrators. Less than one-third have tenure-track positions. Areas shaded in blue are within the postsecondary education sector. 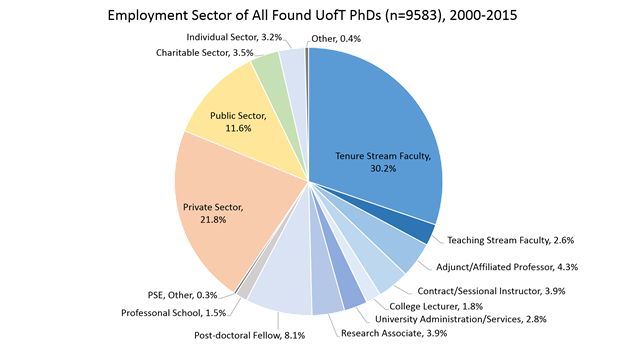 Humanities and social sciences have the largest share of PhD graduates in the tenure stream, with roughly 40 percent each, while physical and life science PhDs are more likely than their peers to be employed in the private sector. Hospitals and governments are the two major employers in the public sector, where 12 percent of PhDs in the study are currently working. The complete findings have been released to the public through an interactive online tool, and a series of mini-reports were created for different audiences, including students, government officials and employers. Data were also collected on graduates’ nationalities and where they went – geographically and by employment sector – after earning their PhD. 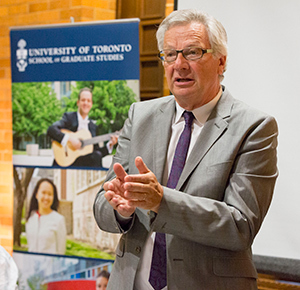 The 10,000 PhDs project was spearheaded by U of T biochemistry professor Reinhart Reithmeier. In 2012, he gathered a decade’s worth of data on his own department, which indicated that just 15 percent of former grads were working as professors. He recalled thinking to himself, after receiving the data, “that can’t be right.” Nevertheless, he said he was impressed with the outcomes, which spurred him to create professional development opportunities in his department. In January 2016, he pitched the idea of the 10,000 PhDs Project to the school of graduate studies as a way to be transparent about PhD outcomes. He hired a team of undergraduate researchers to compile data from public sources on the internet, such as convocation lists and social media. The group managed to collect data on 85 percent of past graduates, and by crosschecking their data with departmental alumni records, were able to bring the total to 88 percent. “We hope that our study will motivate other universities to accumulate employment outcome data for their graduate students, so they can make more informed choices as to their career paths,” said Dr. Reithmeier. In 2005 and 2011, the Ontario government gave extra funding to universities to increase graduate enrolment by 14,000 and 6,000 additional spaces, respectively. As a result, at U of T, the number of PhD graduates nearly doubled over a 15-year period. The largest increase was in physical sciences, followed by life sciences and then social sciences, while the number of humanities graduates remained constant. Other Canadian projects have gathered and publicized PhD career outcomes: institutionally, at the University of British Columbia, for example; by discipline, such as the TRaCE project tracking humanities outcomes; and province-wide through the Higher Education Quality Council of Ontario, or HEQCO. It was the HEQCO report (PDF), published in 2016, that provided the methodology for the 10,000 PhDs project, Dr. Reithmeier said. The HEQCO study looked at the career outcomes of 2,310 doctoral students who graduated from Ontario universities in 2009. It found that just under 30 percent were full-time or tenure-track professors at a university, while another 21 percent had other jobs within academia. Over a third were employed outside academia in a variety of sectors; no employment data were available for the remaining 15 percent. A Conference Board of Canada report, released in 2015, had slightly different numbers. It found that 40 percent of PhD holders work in the postsecondary education sector, but fewer than one in five – 18.6 percent – are employed as full-time university professors, including both tenure and non-tenure-track positions. The remaining 60 percent of PhDs went on to work in other sectors such as industry, government and non-governmental organizations. Read Dr. Reinhart Reithmeier’s closer look at the numbers of the 10,000 PhDs Project. This is a fascinating and critically important study that provides much-needed data and insight regarding the career paths of PhD graduates. Congratulations. It would be valuable to replicate at the national level, using this work as a starting common template. At the CIHR Institute of Health Services and Policy Research, we have been engaged in a PhD training modernization initiative focused on health services research (HSR) and, inspired by the 10,000 PhDs project, plan to track the careers trajectories of HSR PhD graduates across Canada. I’ll bet that this study left out all kinds of folks about whom they could not find “publicly available data” – the ones who just gave up and aren’t working at all. I know several U of T PhDs who are in that situation. Indeed, there is a correlation between graduate students who develop a robust professional network beyond academia along with a strong public profile (e.g., personal web-site, Linkedin profile, résumé, etc. ) and their future employability.